Since first blogging about Hotspot 2.0 and its application to typical enterprise WLAN guest networks I’ve learned quite a bit more thanks to several helpful tweets from Dave Wright of Ruckus Wireless. 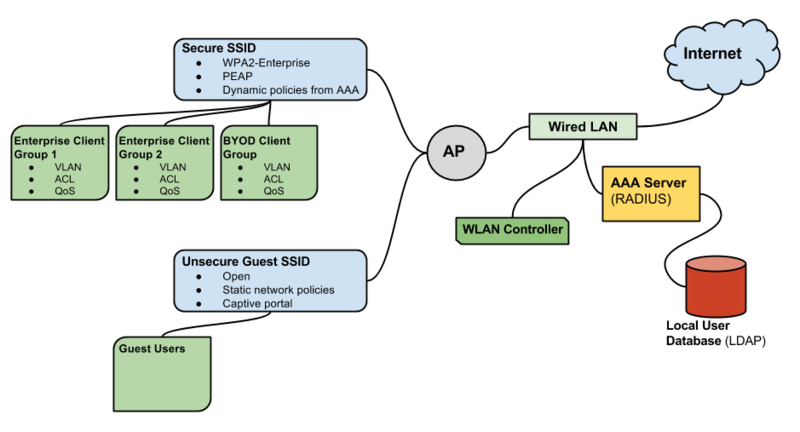 Although the large majority of the focus of Hotspot 2.0 still seems to be on integration with cellular carriers for AAA services and all the complexity and exclusivity that entails, there are provisions for simpler, anonymous, and secure Hotspot 2.0 guest networks that are much closer to what the typical enterprise WLAN operator will actually deploy. As I’ve said before, authentication is not a priority for most WLAN operators on their guest network, but encryption certainly is. Is it the holy grail of guest Wi-Fi? Maybe, but more on that after we look at the Wi-Fi Alliance Passpoint (Release 2) Deployment Guidelines. In all 61 pages of the document, there are these few paragraphs devoted to what I predict to be the most common use of Hotspot 2.0. The user in a Free Public Hotspot initiates the online sign-up registration process with the Free Public Hotspot’s OSU server. During the registration exchange, the OSU server presents the terms and conditions to the user. If the user accepts the terms and conditions, the OSU server issues a credential; if the user refuses, no credential is provisioned. Note that the same credential is issued to all users which have accepted the terms and conditions; therefore, the Hotspot Operator cannot track the identity of an individual user during the Hotspot 2.0 Access state (see section 6). When the user/mobile device returns to the same Free Public Hotspot, the previously provisioned credentials are used to provide secure, automatic access. The mobile device authenticates using EAP-TTLS, which provides for the generation of unique cryptographic keying material even though users share a common password. changed terms and conditions, then a new credential is provisioned. There you have it. Hotspot 2.0 does provide for anonymous and secure guest networks. In short, 802.1X/EAP authentication is accomplished with EAP-TTLS through a common credential that is issued after the signup process. In fact, this has already been deployed by the cities of San Jose and San Francisco. To get an idea of how it works from a user’s perspective, check out the directions here. Yes, you can do this all without Hotspot 2.0 in a less elegant way: Add a notice to your guest network captive portal that users can login to the secure network with a specific generic credential, and even a link to download a .mobileconfig profile for iOS and Mac OS users. 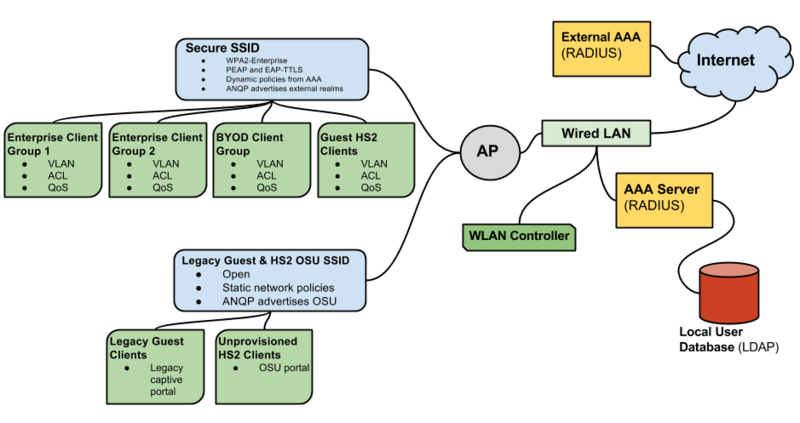 However, the user experience won’t be standardized like it is with an OSU server, and non-Apple users will have to manually configure a connection to the 802.1X network, including adding a cert to their trusted roots. Not good UX. And definitely not fast, free, and easy. The bad news: With Hotspot 2.0, the guest network captive portal is here to stay. The good news: Users only have to wrestle with the captive portal once (unless the client credential is changed). And perhaps the technology behind the portal is more mobile client-friendly than today’s captive portals. Hopefully a HS2 client sees the OSU server being advertised by ANQP and immediately presents a notification to the user. If the user doesn’t play ball, the client should disconnect and the SSID should not be saved as a preferred SSID. The great news: This is a lower-friction way to get secure Wi-Fi to guests. Is this the holy grail? That depends on what you think that is. To me, the barrier to entry is low enough that I think this is a win for guest Wi-Fi. Another wrinkle: The Hotspot 2.0 802.1X network can still be configured to automatically connect guests from known realms. That means that you could add eduroam and the coming anyroam realms to the SSID to onboard users from those participating organizations securely and automatically. And yes, no captive web portal either. So if the opportunities to integrate with AAA clearinghouses grow (exist at all? ), the number of users subjected to the captive portal shrinks. I’m sure there are concerns regarding the possibility of new SSID’s. Luckily, a legacy open guest network can serve Hotspot 2.0 incompatible clients while also delivering the Online Sign Up portal to compatible clients. That means no new SSID’s. I’m looking forward to seeing gear get updated to support Hotspot 2.0 Rev 2 so we can see this in the wild. Ruckus is doing a great job banging the drum for Hotspot 2.0, but other vendors seem to be further behind. Client support is not great (come on, Android), but Apple has supported it since iOS 7, so here’s hoping that will drive others to follow suit.